On a whim a posted a plot on Twitter. It shows a marathon training schedule. This post explains the story behind the graph. I downloaded a few different 17-week marathon training schedules. Most were in imperial measurement and/or were written for time at a certain pace, e.g. 30 min Easy Run etc. I wanted to convert one of these schedules into a proper plan where I input my pace and get an idea of the distance I need to run (in metric). This means I can pick routes to run each day without having to think too much about it. Calculating the running paces was simple using Jack Daniels’ VDot calculator and verifying the predicted paces with my running database. I constructed a spreadsheet from the plan, and then did the calculations to get the distances out. Once this was done I wondered what the rationale behind the schedule is, and the best way to see that is to plot it out. From this plot the way that the long run on each Sunday is extended or tapered is reasonably clear. However, I was wondering about how intense each of the runs will be. Running 5K at threshold is more intense than a 10K easy run. To look at this I just took the average pace for the session. This doesn’t quite tell us about intensity, because a 10 min easy run + 2 intervals + 10 min easy run is not as intense as doing 4 intervals, yet the average pace would be similar. But it would be close enough. I used a colourscale called VioletOrangeYellow and the result was quite intuitive. The shorter runs are organised in blocks of intensity while the long runs are about building endurance. From what I understand, the blocks are to do with adapting to the stresses of increasing running load/intensity. Feedback on the plot was good: runners liked it, non-runners thought it was psychotic. I recently got a new GPS running watch, a Garmin Fēnix 5. As well as tracking runs, cycling and swimming, it does “activity tracking” – number of steps taken in a day, sleep, and so on. The step goals are set to move automatically and I wondered how it worked. With a quick number crunch, the algorithm revealed itself. Read on if you are interested how it works. The watch started out with a step target of 7500 steps in one day. I missed this by 2801 and the target got reduced by 560 to 6940 for the next day. That day I managed 12480, i.e. 5540 over the target. So the target went up by 560 to 7500. With me so far? Good. So next I went over the target and it went up again (but this time by 590 steps). I missed that target by a lot and the target was reduced by 530 steps. This told me that I’d need to collect a bit more data to figure out how the goal is set. Here are the first few days to help you see the problem. The data is available for download as a csv via the Garmin Connect website. After waiting to accumulate some more data, I plotted out the adjustment vs step deficit/surplus. The pattern was pretty clear. There are two slopes here that pass through the origin. It doesn’t matter what the target was, the adjustment applied is scaled according to how close to the target I was, i.e. the step deficit or surplus. There was either a small (0.1) or large (0.2) scaling used to adjust the step target for the next day, but how did the watch decide which scale to use? The answer was to look back at the previous day’s activity as well as the current day. So if today you exceeded the target and you also exceeded the target yesterday then you get a small scale increase. Likewise if you fell short today and yesterday, you get a small scale decrease. However, if you’ve exceeded today but fell short yesterday, your target goes up by the big scaling. Falling short after exceeding yesterday is rewarded with a big scale decrease. The actual size of the decrease depends on the deficit or surplus on that day. The above plot is coloured according to the four possibilities described here. I guess there is a logic to this. The goal could quickly get unreachable if it increased by 20% on a run of two days exceeding the target, and conversely, too easy if the decreases went down rapidly with consecutive inactivity. It’s only when there’s been a swing in activity that the goal should get moved by the large scaling. Otherwise, 10% in the direction of attainment is fine. I have no idea if this is the algorithm used across all of Garmin’s watches or if other watch manufacturer’s use different target-setting algorithms. The post title comes from “Measured Steps” by Edsel from their Techniques of Speed Hypnosis album. Towards the end of 2015, I started distance running. I thought it’d be fun to look at the frequency of my runs over the course of 2016. Most of my runs were recorded with a GPS watch. I log my cycling data using Rubitrack, so I just added my running data to this. This software is great but to do any serious number crunching, other software is needed. Yes, I know that if I used strava I can do lots of things with my data… but I don’t. I also know that there are tools for R to do this, but I wrote something in Igor instead. The GitHub repo is here. There’s a technical description below, as well as some random thoughts on running (and cycling). The animation shows the tracks I recorded as 2016 rolled by. The routes won’t mean much to you, but I can recognise most of them. You can see how I built up the distance to run a marathon and then how the runs became less frequent through late summer to October. I logged 975 km with probably another 50 km or so not logged. To pull the data out of rubiTrack 4 Pro is actually quite difficult since there is no automated export. An applescript did the job of going through all the run activities and exporting them as gpx. There is an API provided by Garmin to take the data straight from the FIT files recorded by the watch, but everything is saved and tagged in rubiTrack, so gpx is a good starting point. GPX is an xml format which can be read into Igor using XMLutils XOP written by andyfaff. Previously, I’ve used nokogiri for reading XML, but this XOP keeps everything within Igor. This worked OK, but I had some trouble with namespaces which I didn’t resolve properly and what is in the code is a slight hack. I wrote some code which imported all the files and then processed the time frame I wanted to look at. It basically looks at a.m. and p.m. for each day in the timeframe. Igor deals with date/time nicely and so this was quite easy. Two lookups per day were needed because I often went for two runs per day (run commuting). I set the lat/lon at the start of each track as 0,0. I used the new alpha tools in IP7 to fade the tracks so that they decay away over time. They disappear with 1/8 reduction in opacity over a four day period. Igor writes out to mov which worked really nicely, but wordpress can’t host movies, so I added a line to write out TIFFs of each frame of the animation and assembled a nice gif using FIJI. Getting into running was almost accidental. I am a committed cyclist and had always been of the opinion: since running doesn’t improve aerobic cycling performance (only cycling does that), any activity other than cycling is a waste of time. However, I realised that finding time for cycling was getting more difficult and also my goal is to keep fit and not to actually be a pro-cyclist, so running had to be worth a try. Roughly speaking, running is about three times more time efficient compared to cycling. One hour of running approximates to three hours of cycling. I thought, I would just try it. Over the winter. No more than that. Of course, I soon got the running bug and ran through most of 2016. Taking part in a few running events (marathon, half marathons, 10K). A quick four notes on my experience. The key thing to keeping running is staying healthy and uninjured. That means building up distance and frequency of running very slowly. In fact, the limitation to running is the body’s ability to actually do the distance. In cycling this is different, as long as you fuel adequately and you’re reasonably fit, you could cycle all day if you wanted. This not true of running, and so, building up to doing longer distances is essential and the ramp up shouldn’t be rushed. Injuries will cost you lost weeks on a training schedule. There’s lots of things “people don’t tell you” about running. Blisters and things everyone knows about, but losing a toenail during a 20 km run? Encountering runner’s GI problems? There’s lots of surprises as you start out. Joining a club or reading running forums probably helps (I didn’t bother!). In case you are wondering, the respective answers are getting decent shoes fitted and well, there is no cure. Going from cycling to running meant going from very little upper body mass to gaining extra muscle. This means gaining weight. This is something of a shock to a cyclist and seems counterintuitive, since more activity should really equate to weight loss. I maintained cycling through the year, but was not expecting a gain of ~3 kilos. As with any sport, having something to aim for is essential. Training for training’s sake can become pointless, so line up something to shoot for. Sign up for an event or at least have an achievement (distance, average speed) in your mind that you want to achieve. So there you have it. I’ll probably continue to mix running with cycling in 2017. I’ll probably extend the repo to do more with cycling data if I have the time. The post title is taken from “Colours Running Out” by TOY from their eponymous LP. I needed to generate a uniform random distribution of points inside a circle and, later, a sphere. This is part of a bigger project, but the code to do this is kind of interesting. There were no solutions available for IgorPro, but stackexchange had plenty of examples in python and mathematica. There are many ways to do this. The most popular seems to be to generate a uniform random set of points in a square or cube and then discard those that are greater than the radius away from the origin. I didn’t like this idea, because I needed to extend it to spheroids eventually, and as I saw it the computation time saved was minimal. Here is the version for points in a circle (radius = 1, centred on the origin). This gives a nice set of points, 1000 shown here. And here is the version inside a sphere. This code has variable radius for the sphere. The three waves (xw,yw,zw) can be concatenated and displayed in a Gizmo. The code just plots out the three views. My code uses var + enoise(var) to get a random variable from 0,var. This is because enoise goes from -var to +var. There is an interesting discussion about whether this is a truly flat PDF here. This is part of a bigger project where I’ve had invaluable help from Tom Honnor from Statistics. This post is part of a series on esoterica in computer programming. 2016 was the 400 year anniversary of William Shakespeare’s death. Stratford-upon-Avon Rotary Club held the Shakespeare Marathon on the same weekend. Runners had an option of half or full marathon. There were apparently 3.5 K runners. Only 700 of whom were doing the full marathon. The chip results were uploaded last night and can be found here. Similar to my post on the Coventry Half Marathon, I thought I’d quickly analyse the data. The breakdown of runners by category. M and F are male and female runners under 35 years of age. M35 is 35-45, F55 is 55-65 etc. Only a single runner in the F65 category! The best time was 02:34:51 by Adam Holland of Notfast. Fastest female runner was 3:14:39 by Josie Hinton of London Heathside. Congrats to everyone who ran and thanks to the organisers and all the supporters out on the course. The end of the month sees the Coventry Half Marathon. I looked at what constitutes a good time over this course, based on 2015 results. I thought I’d post this here in case any one is interested. The breakdown of runners by category for the 2015 event. Male Senior (MSEN) category has the most runners, constituting a wide age grouping. There were 3565 runners in total, 5 in an undetermined category and 9 DNFs. These 14 were not included in the analysis. The best time last year was 01:10:21! Good luck to everyone running this (or any other event) this year. Edit: The 2016 Coventry Half Marathon happened today. I’m updating this post with the new data. The width of violins has no special significance compared to 2015. Fastest time this year was 1:08:40 in the MSEN category. There were more runners this year than last (4212 finishers), across all categories. Also this year there was a wheelchair category, which is not included here as there were only four competitors. FWIW, I placed somewhere in the first violin, in the lower whisker :-). Congrats to everyone who ran and thanks to the all the supporters out on the course. This post follows on from a previous post on citation distributions and the wrongness of Impact Factor. Stephen Curry had previously made the call that journals should “show us the data” that underlie the much-maligned Journal Impact Factor (JIF). However, this call made me wonder what “showing us the data” would look like and how journals might do it. What citation distribution should we look at? The JIF looks at citations in a year to articles published in the preceding 2 years. This captures a period in a paper’s life, but it misses “slow burner” papers and also underestimates the impact of papers that just keep generating citations long after publication. I wrote a quick bit of code that would look at a decade’s worth of papers at one journal to see what happened to them as yearly cohorts over that decade. I picked EMBO J to look at since they have actually published their own citation distribution, and also they appear willing to engage with more transparency around scientific publication. Note that, when they published their distribution, it considered citations to papers via a JIF-style window over 5 years. I pulled 4082 papers with a publication date of 2004-2014 from Web of Science (the search was limited to Articles) along with data on citations that occurred per year. I generated histograms to look at distribution of citations for each year. Papers published in 2004 are in the top row, papers from 2014 are in the bottom row. The first histogram shows citations in the same year as publication, in the next column, the following year and so-on. Number of papers is on y and on x the number of citations. Sorry for the lack of labelling! My excuse is that my code made a plot with “subwindows”, which I’m not too familiar with. In the year of publication, most papers are not cited at all, which is expected since there is a lag to publication of papers which can cite the work and also some papers do not come out until later in the year, meaning the likelihood of a citing paper coming out decreases as the year progresses. The following year most papers are picking up citations: the distribution moves rightwards. Over the next few years the distribution relaxes back leftwards as the citations die away. The distributions are always skewed. Few papers get loads of citations, most get very few. Although I truncated the x-axis at 40 citations, there are a handful of papers that are picking up >40 cites per year up to 10 years after publication – clearly these are very useful papers! To summarise these distributions I generated the median (and the mean – I know, I know) number of citations for each publication year-citation year combination and made plots. The mean is shown on the left and median on the right. The layout is the same as in the multi-histogram plot above. Follow along a row and you can again see how the cohort of papers attracts citations, peaks and then dies away. You can also see that some years were better than others in terms of citations, 2004 and 2005 were good years, 2007 was not so good. It is very difficult, if not impossible, to judge how 2013 and 2014 papers will fare into the future. What was the point of all this? Well, I think showing the citation data that underlie the JIF is a good start. However, citation data are more nuanced than the JIF allows for. So being able to choose how we look at the citations is important to understand how a journal performs. Having some kind of widget that allows one to select the year(s) of papers to look at and the year(s) that the citations came from would be perfect, but this is beyond me. Otherwise, journals would probably elect to show us a distribution for a golden year (like 2004 in this case), or pick a window for comparison that looked highly favourable. Finally, I think journals are unlikely to provide this kind of analysis. They should, if only because it is a chance for a journal to show how it publishes many papers that are really useful to the community. Anyway, maybe they don’t have to… What this quick analysis shows is that it can be (fairly) easily harvested and displayed. We could crowdsource this analysis using standardised code. Below is the code that I used – it’s a bit rough and would need some work before it could be used generally. It also uses a 2D filtering method that was posted on IgorExchange by John Weeks. The post title is taken from “The Great Curve” by Talking Heads from their classic LP Remain in Light. In the lab we have been doing quite a bit of analysis of cell migration in 2D. Typically RPE1 cells migrating on fibronectin-coated glass. There are quite a few tools out there to track cell movements and to analyse their migration. Naturally, none of these did quite what we wanted and none fitted nicely into our analysis workflow. This meant writing something from scratch in IgorPro. You can access the code from my GitHub pages. The CellMigration repo contains an ipf that has three functions which will import tracks into Igor and analyse them. 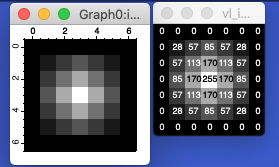 We use manual tracking in ImageJ/FIJI to obtain the co-ordinates for analysis, this is the only non-Igor part. I figured it was not worth porting this part too. Instructions are given in the repo and are hopefully self-explanatory. Here’s a screenshot of a typical experiment. Acknowledgements: Colour palette is taken from the SRON stylesheet. The excellent igorutils (by yamad) gave me the idea for a structure and jtigor helped me with referencing StrConstants. I was searching for the excitation and emission spectra for mNeonGreen. I was able to find an image, but no values for the spectra. Here is an approximation of the spectra (xlsx format, still haven’t figured out csv for wordpress). I got these values using IgorThief.ipf a very handy tool that allows the extraction of XY coordinates from a bitmapped plot (below). mNeonGreen is available from Allele Biotechnologies. Here is a great site for comparing fluorescent protein properties.